The town of Tabanan, Bali is home to Tanah Lot Temple. A beautiful and magnificent temple standing on an offshore island. Right in the northwestern of Denpasar. As thousands of tourist visit this site every year. Then the government thought of an upgrade. That's how Tanah Lot Arts Festival started. 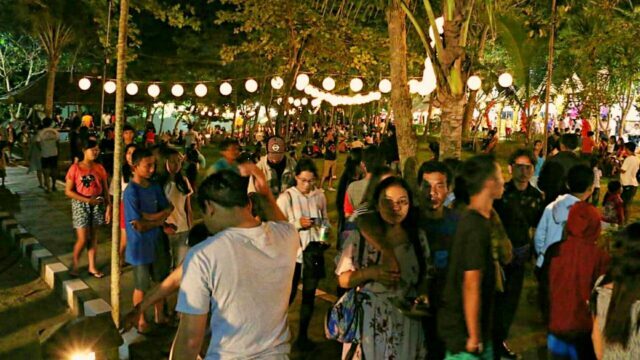 First held in 2017, the event is meant to bring back tourist to the island. That's been declining since the eruption of Gunung Agung. The festival proved a success. As it attracted a whopping 45,000 visitors on its inauguration. And in 2018 festival, it gets more ambitious. The target was 55,000 thousands of visitors. It also introduces a massive performance by 1800 dancers called Rejang Sandat. 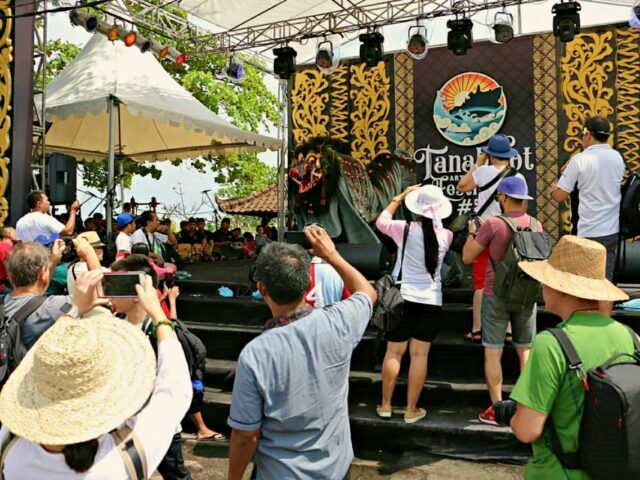 Tanah Lot Arts Festival runs for three days showcasing numerous cultural Tabanan heritage. While the schedule isn't limited to arts, it also has culinary sections. Where the coffee festival will also take part. It exhibits local coffee variety as well as talented baristas from coffee shops across the city. Rejang Sandat Dance is a tribute to the Gods who give bountiful gifts: nature. The creator of Rejang Sadat is Tabanan Regent, Ni Putu Eka Wiryastuti. She claimed the inspiration for the dance comes from a long meditation journey. It's a well-thought choreography with gratitude to the gods as its philosophy. The result takes a breath away. A spectacular display as thousands of dancers performing the colossal in tandem. It's magical to see. The mythical element comes from the fact that this dance full name is Rejang Sandat Ratu Segara. Ratu Segara is the mythical queen of the southern sea. In a way, Rejang Sandat also acts as a tribute for her. During the event, villages across Tabanan will take turns. To show the audience their most sacred arts. Baturiti Village introduces Okokan, a variety of gamelan music art. Meanwhile, get lost in melody. As 30 to 40 musicians play the traditional bamboo instrument called Tektekan. Those two arts are only a few of among things the crowd gets to enjoy at Tanah Lot Arts Festival. Don't miss the local music bands Motifora and comedy group Lawak Trio Celekontong Mas. Aside from performance out of another contemporary lineup. Bali exotic arts from neighboring regions and Balinese culture, in general, also get to show off. Uluwatu region will present its popular Kecak Dance. In addition to that, watch the Parade of Gebogan. The Bali art of stacking fruits as offerings, also in the list of appearance. A touch of technology gives colors to the Tanah Lot Arts Festival. After the sunset, the audience might not want to leave the venue yet. It's time for the multimedia light show. A harmonization of Balinese past and present, between traditional and modern. Enjoy the play of lights and optical illusion. While the whole show gets its pump by music. It's both a treat to the eyes and the ears. Tabanan highlight Rujak as the star dish of the Tanah Lot Arts Festival. There are several variations of Rujak. Like Rujak Kuah Pindang, and Rujak Bulung. Some people that might not know Rujak is some sort of salad. It's basically a mix of cucumber, pineapple, papaya, and other tropical fruits. The finishing touch is the fish "pindang" soup poured on top of this fruit and vegetable mix. The result is an explosion of flavor, from sour, salty to sweet. Meanwhile, Rujak Bulung consists of seaweed mainly. The serving is likely the same with a splash of Pindang sauce on top of it. For dessert, Tabanan has numerous delectable options. The popular ones include Kacang disco, Klepon, and Pie Susu. Literally means dancing nuts, Kacang disco is flour-coated and deep-fried crunchy peanuts. Klepon is sticky balls made from glutinous flour with sweet sugary surprise in each bite. Be careful not to get addicted to Pie Susu. This snack has stolen the heart of many with its delightful taste. Coffee is the recently "hype" Tabanan local product, especially Robusta from Pupuan Village. At Tanah Lots Arts Festival, at least a dozen coffee shops sending representatives to the event. Meet talented local barista with amazing brewing skills. Try some of their crafts. 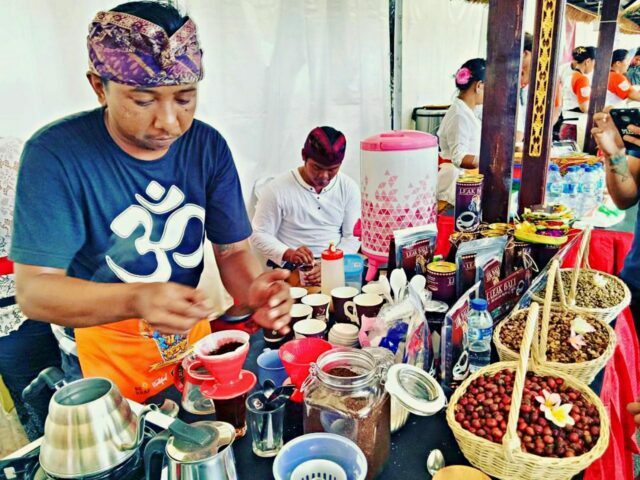 And taste one of the most heavenly cups of coffee visitors can find on the island of Bali. 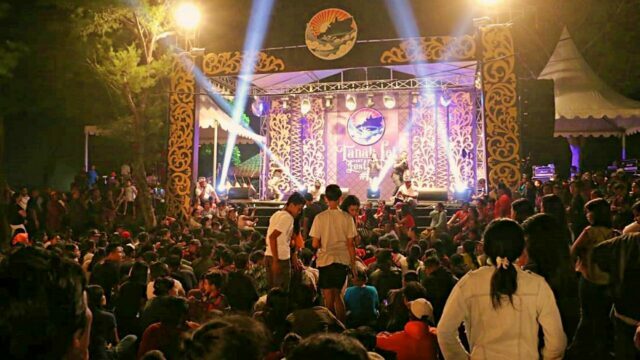 Tanah Lot Arts Festival will be held on 20 July this year. The event takes place in Tanah Lot Beach, Tabanan, Bali. No ticket is required to attend the festival. However, prepare to pay for the entrance fee of Tanah Lot temple, at IDR 60k per visitor. See: Cycling in UNESCO World Heritage, Jatiluwih Rice Terrace. The organizer prepares enough security police and lifeguards. Since the event is held by the beach. The culinary stands are more than enough to fulfill visitors' need for food and beverage. Facilities provided by Tanah Lot itself include parking lot, toilets, and storage rooms. As for accommodation, plenty of choices can be found around the area. The rates are of Bali standard, around IDR 300k-600k on average. Tanah Lot temple location is 20 km away from Denpasar. From Ngurah Rai airport, take Trans Sarbagita busses line Ngurah Rai - Mengwi and stop at Kediri Tabanan. Continue with a public van heading to the temple. From the airport, it can take 2 hours to reach the destination include the transfer time. Rental motorcycles are one of the popular ways to get around Bali with ease. Head to the nearest rental service. With only IDR 60k rent per day, get a nice scooter to roam freely. Private vehicles can follow this route from Kuta: Kuta - Sunset Road - Kerobokan - Canggu - Bypass Munggu - Tanah Lot. Another option available is using the shuttle service Kura-Kura bus and it costs IDR 250k for a round trip.